On 1st July 1916 British infantry engaged in one of the most bloody battles in history; the Somme Offensive. The plan was simple; for seven days prior, the British Expeditionary Forces would rain down heavy shells on the German front lines. During that period, almost two million shells fell on the German lines. In the last hour of the bombardment 3,500 shells per minute were fired by British guns making it the largest bombardment to that point in the history of warfare. The belief was that the bombardment would knock out the German strength and allow the infantry to take the field. On the front lines however, it was a different story. As the infantry went over the top German MG-80 machine guns opened up with ferocious fire. With 500 bullets a minute the British forces were mowed down in their thousands. By the end of that first day 20,000 men were dead and another 40,000 wounded. This day is remembered as one of the greatest disasters in military history. The attrition continued for another four and a half months. Although no Canadian infantry units were involved on the first day of the Somme Offensive two batteries of heavy supported the assault. The Canadians would have their day at the Somme and they would prove their worth to the war effort. The 4th Division was engaged in the middle of September at the Battle of Courcelette. Today we went on a route march and were inspected by the king. I saw the king and the officers with him distinctly. The Diary of the 11th recorded this special day also. The actual inspection on July 1st, by the King was a memorable event. A happier celebration of Dominion Day under the circumstances would have been difficult to conceive. 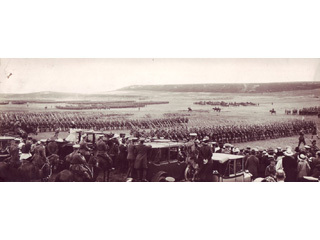 The Field Ambulances, being at the rear of the March past, had a good view of the waves of infantrymen swinging past His majesty to the rhythm of the music of the band and to the flashing of a myriad of bayonets, like the play of sunlight on the ruffed bosom of a lake. Nor will the rattling noise of line after line of artillery as they turned from the straight of the march past and raced down the slope to their positions, be readily forgotten. Before the march past, His Majesty, who was accompanied by Lord French, rode round the various lines, thereby enabling every man to get a good view of his person. The review loses with ringing cheers for the King, who later expressed the pleasure and satisfaction the day had afforded him. Why Does God Allow Children To Suffer? Aaron Dunlop on Why Does God Allow Children To Suffer? Al & Mona Schreyack on Why Does God Allow Children To Suffer? Aaron Dunlop on Why Salvation by Blood? Das.N on Why Salvation by Blood?